The Earl and MoM indicators are clearly going up, with no signs of topping out yet. But the slower Earl2 (orange line) is merely flatlining below the zero line, which is exactly what I warned for in last week’s post. We need to watch carefully what happens in the next week or two. If the markets just chop around with S&P 500 stalling below 2500 and Nasdaq staying near the 6400 level, then it would indicate a very weak market with little or no fuel left. Then the Earl2 would probably continue to negate the new highs and that would be an ugly setup heading into August-September. See late September 2016 for a recent example of such an Earl2 non-confirmation. Stocks climbed to marginal new highs after a pullback, but the Earl2 stayed very weak below the zero line. A more significant second dip followed suit. 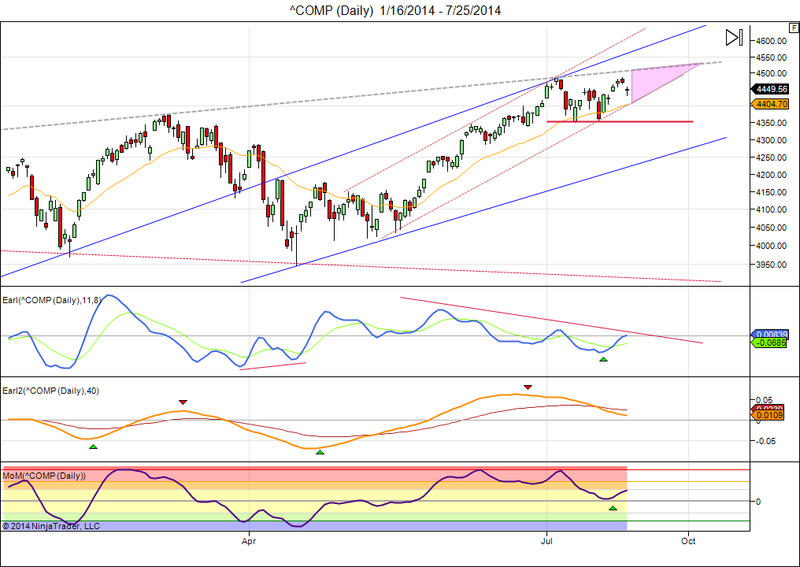 A more vigorous advance with S&P climbing above 2500 would reduce this concern. So it is show time. We are in a new lunar green period, but that has not resulted in a sustained upward move so far. Meanwhile the Earl and MoM indicators keep going up, while the slower Earl2 (orange line) is about to bottom out at a deep low, on a par with the major lows it reached in April and October 2014. Three weeks ago I recommended to stay very cautious until we see a clear bottom in the Earl2 indicator. The Earl2 is now flattening out and will probably turn up in the next few days, so now is the time to start looking for some bargains. Major upward resistance is near 4800, the late 2014 highs. And support is probably just below 4600, the January lows. I would also like to point out that the Skew index hit a very high 142 last Friday. This means that a lot of crash insurance was being bought and unusually high premiums were being paid. Fear is very high in the market. From March until a few weeks ago the Skew rarely went above 130 and mostly traded near 120. This means investors weren’t all that worried and didn’t buy much crash insurance (if any). But now that we have seen a market drop the Skew is suddenly jumping to its highest level in almost a year. This is an example of buying boots after the flood. 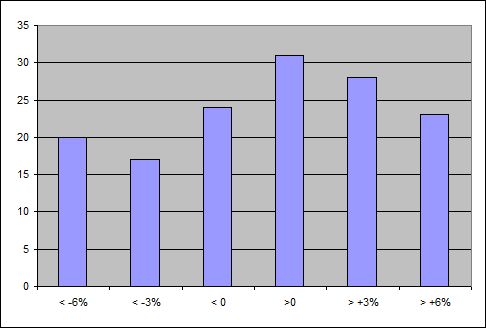 See the article on Skew index that I posted earlier this year: Forget the VIX, watch the SKEW. This suggests we are in a short term correction, not at the start of a long bear market. Throughout the bear markets of 2000-2003 and 2007-2009 the Skew consistently stayed low and didn’t even get above 130, much less 140. A low Skew means complacency, a high skew means fear. So, right now we have fear. And as the saying goes, it is time to buy when others are fearful. Gold had a nice bout of bullish energy (green) in the beginning of 2015. “Lava” marked the peak in January. “Floating ice” appeared at a bottom in March. Some erratic bullishness showed up in May and June, but that hardly managed to keep the market flat. “Floating ice” marked the next bottom in July. And now we have had another rally attempt, but bullish energy is even weaker than on the previous occasion. It has only painted a few “small islands”. In a healthy bullish market the amount of green climbs above 4, and that’s what I would wait for if you are looking to buy gold for long term. If you missed out on my earlier article introducing the Iceberg charts, you can find it here. 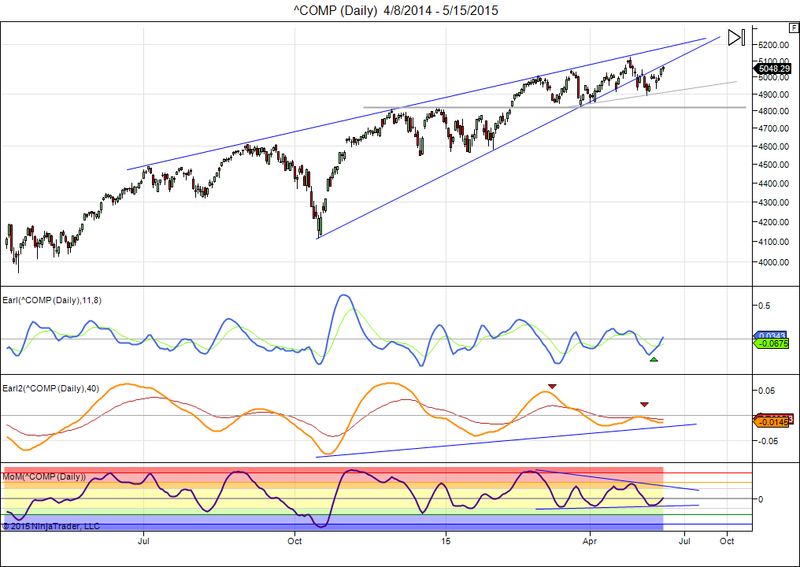 The Nasdaq appears to be breaking out from its large rising wedge pattern. The breakout is to the downside, but we start seeing signs that the market is reversing already, potentially handing us a failed breakout. 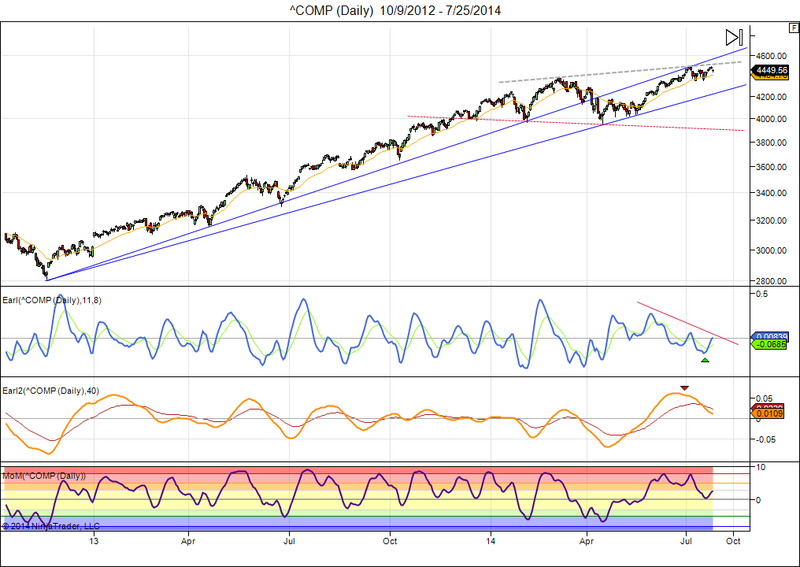 If the market is really weak, we should have seen a drop to the 4800 support level before seeing some rebound attempt. But buyers didn’t even wait for 4800 and already stepped in at 4900. That is a sign of strength and must be frustrating traders with bets to the downside. We are still likely to get a big move within the next months, but the odds are increasing that the move will be up rather than down. I now estimate about 60% chance that the move will be up. What could trigger another big rally? Well, bonds have seen a significant global sell-off in recent weeks. That means that all the QE related buying in the world was easily overcome by even larger bond sales. What are those sellers going to do with their new cash? Put it back into the bond market are near zero yields? Not likely. Some of that money is going to find its way into stocks, especially if they break out to the upside after almost 6 months of sideways action. When ultra low rates start being seen as something semi-permanent the average p/e level of stocks tends to climb to 30 rather than its more normal 15-20. At some point retail investors start realizing that bonds yielding 2% are basically trading at a p/e of 50 , so stocks with a p/e of 20 start looking comparatively cheap. When small investors start selling bonds and buying stocks we will have entered the last explosive stage of a long bull market. Social media were full of messages how bearish this kind of market action is, as if people had been waiting for this. And yes, the logic seems to make sense: if the market cannot hold on to early gains, then sells off more than 1.5% intraday, it can hardly be seen as a sign of strength. The problem is: when was the last time the market was logical? No matter how logical a trading concept may appear to be, and no matter how many experienced traders are telling you about it, it is always important to test. And we have plenty of stock market history to verify what really happens after this kind of disappointing days. So, that’s what I did. Here are the results. I defined a disappointing day as a day on which the market opens above the previous day’s close, but ends the day below it. 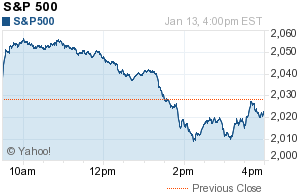 And the market must be down 1.5% or more from the intraday highs it reached to qualify as a disappointing day. To test what typically happens next we then look where the market was 5 and 20 trading days later, compared to the closing price on the disappointing day as defined above. I did the same test on the Nasdaq since the 1980s, which gives us a larger sample of 385 cases thanks to Nasdaq being more volatile. Also here we find that in 57% of the cases the Nasdaq is up 5 and 20 days after a disappointing day. In these 385 cases the Nasdaq has on average climbed 0.5% within 5 days, which is over 26% annualized. This means that a disappointing day like the one we have seen yesterday has historically been a bullish sign, not a bearish one. The average gain 5 days later is 3.5% and the average loss 5 days later is 3.55%. But there is a gain 57% of the time, so going short after a disappointing day has not been a profitable strategy in the last 30 years. 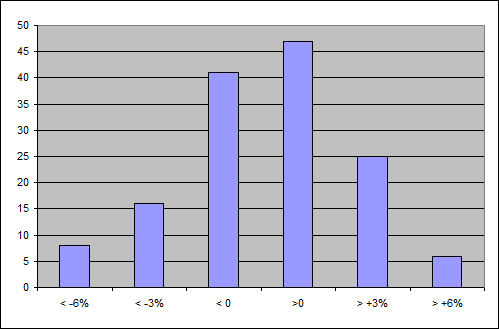 In 44 cases (11%) we see the Nasdaq more than 10% lower after 20 days. In 58 cases (15%) the Nasdaq is more than 10% higher after 20 days. 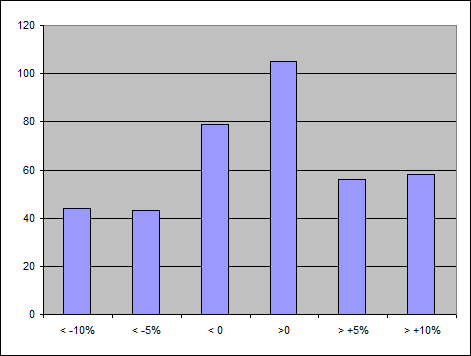 Bottom line: a disappointing day in the market is more or less neutral with 57% odds that the market will be higher one week and one month after this day. The idea that this kind of days are a bearish omen is thus not supported by history. Slightly more often than not it is actually very bullish going forward. If there is anything bearish about these disappointing days then it will take additional qualifiers to get it to work. If you have ideas or links to similar studies then feel welcome to post them as a comment. We had some wild swings in the stock market last week. Is it the start of something bigger? Could be, but I think we are already close to a bottom and I expect that we will have rather quiet year end trading next. The S&P 500 is retesting the 2000 levels and the Nasdaq is almost back to 4600, much as I had suggested a few weeks ago. After a 600 point rally it is not abnormal to see a 200 point give-back. 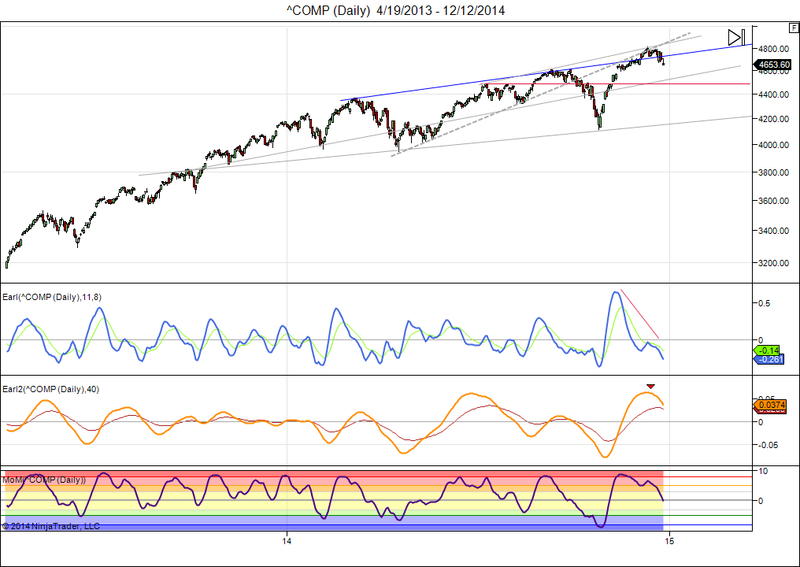 We may go down to 4500, but at some point fresh buyers will probably step in pushing the Nasdaq back up. Technically the Earl2 is now clearly down, but the faster Earl (blue line) is already in bottom territory, and that could set the market up for a little santa rally to start this week. Even though the recent move looks quite similar to the start of the recent October correction, I don’t think that similarity will hold up much longer. Too many investors seem to be looking for another October style drop. A recentism bias rarely pays off in stock markets. We remain in a lunar green period until xmas, and that usually supports stocks as well. I think we have already seen the highs for the year, and most likely we are now in a sideways period that could stretch well into early next year. What about a down December? 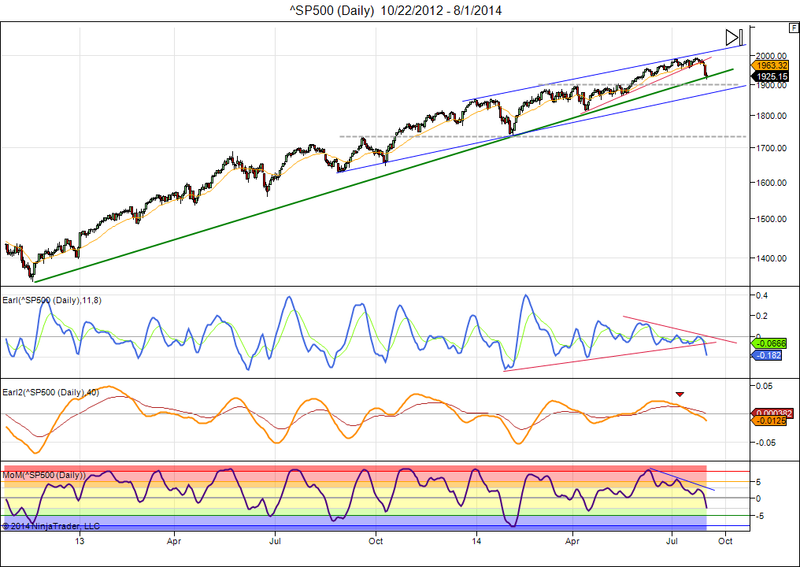 The S&P has dropped to support at long term trend line (green line) near 1930. Will buyers appear at this level? Maybe, maybe not. None of my technical indicators show any sign of a bottom at this point, but that could change if the market manages to hang on to this 1925 level for several more days. Clearly, the prospect for new highs in August, as we discussed in last week’s post, is now a more remote scenario. Meanwhile, the Nasdaq sits right at the 4350 level, the July lows. This keeps the possibility alive for another run to 4500+… IF buyers show up this week. Bottom line: both the S&P 500 and the Nasdaq are at a next breaking point. And the technicals still look poor. I think the odds for a rebound or sideways “hanging-on mode” are fairly equal to the odds of a quick further drop this week. If the current support level gives way then I would look for 1880 and then 1730 as likely downside targets for the S&P 500. If buyers show up at these levels then this will be another whipsaw move that is quickly forgotten. US stock markets have been fairly flat in July, neither breaking down nor breaking out to the upside. The current lunar green period will end Wednesday. So far it looks like a rather weak green period, but we have a few more days to go. The upcoming red period will contain a supermoon. Over the last 60 years supermoon red periods have on average been rather positive for stocks, unlike normal red periods. See my article: https://lunatictrader.wordpress.com/2013/06/24/trading-the-super-moon/. Does that mean the market will climb even higher? We cannot rule it out. Sometimes the market does go down in supermoon periods, but more often it goes up. Note: in the media you may read that we are having three supermoons in a row (July – September). Technically that’s true, but for my research I consider the one that comes closest to Earth and for this year that is the August supermoon. Nasdaq is clearly hesitating near overhead resistance lines. Even though it feels like a bull market, we can see that this could be an ongoing sideways pattern that started last December, trading above and below 4200 alternatingly. If so, then a drop back to 3950 could come next. Technically, my slower Earl2 indicator continues to point down, but the shorter term Earl is more positive and also MoM has turned back up after touching the zero line. This means we could first reach the 4530 level that my price target algorithm has been pointing out since the middle of March. 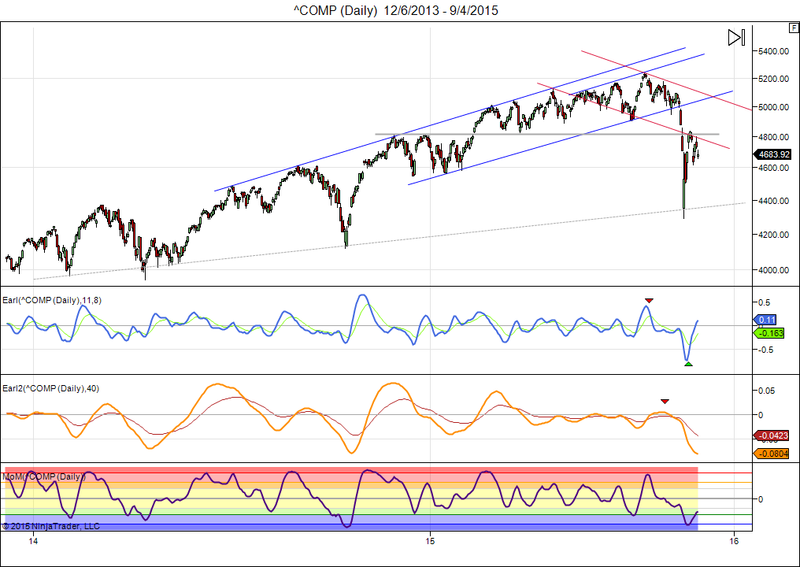 Prices have been contained within a nice channel that started in late April. With both Earl and MoM in rather neutral territory and the market in indecisive mode, we will continue to grind sideways inside the pink triangle until there is a clear breakout, up or down. That could give us a 4530 high print, as that’s where the overhead resistance (grey dashed line) lies for the coming weeks. On the downside I watch the July lows ~4350. A break below that level would tell many traders that the trend has turned down, and would probably trigger significant selling with the 3900-4000 area as the first downside target.